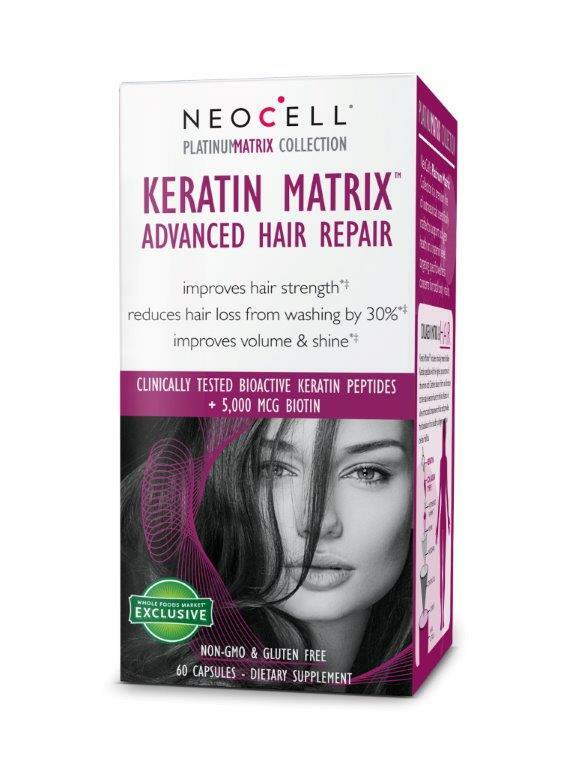 I received a bottle of Neocell Keratin Matrix:Advanced Hair Repair from Neocell to try out. I have tried various other Neocell products before with great results. In fact, I love their products. They perform well, do as they say they will on the bottle and always perform way above my expectations. This one is expected to help grow hair, grow hair fuller, longer, thicker and it helps improve hair's strength. It also reduces hair loss from washing by up to 30% and will improve volume and shine. That is a lot to expect from these capsules. Will they perform that well? Percent Value is based on a 2,000 calorie diet **Daily value not established. Other ingredients are: vegetable magnesium stearate and vegetable capsule. As you can see, Keratin Matrix (as I am just going to call it from here) capsules are full of vitamins and minerals that the hair needs to grow full and strong. They contain Biotin, which helps the hair grow, helps it grow fast and grow stronger. The keratin in the capsules will help the hair look fuller, have more volume and look shinier. The Amla Extract helps undo hair damage and is one of the main Ayurvedic ingredients that has been used for centuries for hair strengthening, making hair look voluminous and keeping hair from being lost during washing. What was my experience with Keratin Matrix? Very good. I can tell you that my hair, which has always been full, but I would lose a lot during washing. That changed during the month that I took these capsules. Also during the month that I took the capsules it grew a lot. And I mean a lot. I had to color my hair significantly quicker than usual, by about 1 1/2 weeks quicker. My hair was definitely fuller and thicker than usual. And my hair is normally full and thick. Now, when it came time to measure hair loss from washing, that was where things made a huge difference. Normally I lose a lot of hair when I wash it. Not so now. I lost less than half of what I normally lost when I wash my hair!!!!!!!!!!! And my hair is super shiny, without even using product on it. I am completely amazed by how beautiful it looks. My hair has not looked this good in ages. It has been dull and lifeless. Keratin Matrix: Advanced Hair Repair did an amazing job on my hair. I am very pleased with the results. Very pleased. 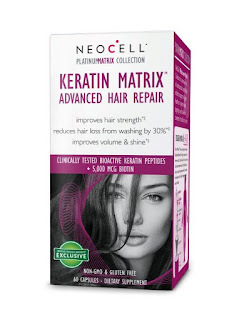 Neocell Keratin Matrix:Advanced Hair Repair capsules are exclusively available at Whole Foods Markets for $24.95 per 60 capsules, which is a month's supply. Two capsules are taken every day. Like Neocell on Facebook: https://www.facebook.com/NeoCellCollagen; Follow Neocell on Twitter: @NeoCellHealth; Follow Neocell on Instagram: http://instagram.com/neocell/; Subscribe to Neocell on YouTube: https://www.youtube.com/user/neocellcorp?feature=CAQQwRs%3D and Follow Neocell on Pinterest: http://www.pinterest.com/neocell/.